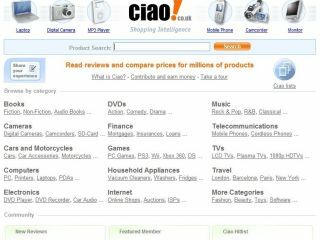 Microsoft has bought Ciao, one of Europe's biggest price comparison engines. Designed to boost its Live Search offering, it seems Microsoft will position its new toy right up against Google's Product Search, formerly known as Froogle. There's no getting away from it – Microsoft is still loosing badly when it comes to the search market. But instead of growing the Windows Live Search business organically, dear old Microsoft seems determined to buy elements which it thinks make sense, hence the hovering up of Multimap and now Ciao. It's not a small wedge of cash involved, either. The deal is worth approximately $486 million. According to analyst comScore, Ciao currently has more than 26.5 million unique visitors per month across seven countries. Microsoft says Ciao's technology platform, online community and extensive merchant relationships will be integrated with its Live Search platform. The corporation says it wants to make Live Search "the premier destination for consumers looking to research and purchase goods and services online." "Integrating Ciao's capabilities into Live Search will provide a strong launchpad for our commercial search offer in Europe and enhance our e-commerce offering on MSN, " says John Mangelaars, head of Microsoft Consumer and Online in Europe. Microsoft's search strategy is focused on three key areas it says: "delivering the best results, simplifying key tasks and innovating in the business model." The corporation has also recently launched a European Search Technology Centre to enhance its results.